Is there really that much to distinguish cruise lines? This cruise is our fifth, and each has been on a different cruise line. In general, one won’t complain about the food on any cruise line. That certainly is not the case here on Holland America’s ship the Noordam, wending its way in a leisurely fashion toward the southern Caribbean. The staterooms on Holland America don’t look much different than staterooms on Royal Caribbean or Norwegian. They all have a promenade where those who prefer to move can stroll around the ship’s periphery, smell the salt air and get a little cardiovascular exercise. I noticed the picture gallery and theaters were in the very same spots on this cruise line as they were in the last two. Differences between cruise lines tend to be more of style than anything else. Carnival, unsurprisingly, has a reputation for partying, young adults and families with small children. Royal Caribbean is more buttoned down. Holland America is definitely not a party ship. It is mostly a well-moneyed old people’s ship. There are a few middle aged people on the ship, by which I mean thirty or forty something, but just a few. By that criteria I no longer qualify. Still, I skew younger than the average age of a passenger on the Noordam. Sixty or seventy something is more par for the course. Expect passengers with canes, walkers and motorized carts. Holland America and the Noordam in particular is just more relaxed and quiet in general than other cruise lines we’ve experiences. There are fewer long waits at the elevators. There are fewer passengers elbowing you in the hallways. The staff doesn’t try quite so hard to ply you with booze (extra of course) or to petition you to buy overpriced art. Moreover, checking in was a breeze. We were expecting a ninety-minute process and long lines. Passengers tend to show up en masse as soon as the cruise line opens its doors. Two hours before sailing, at least for us, there was no line. 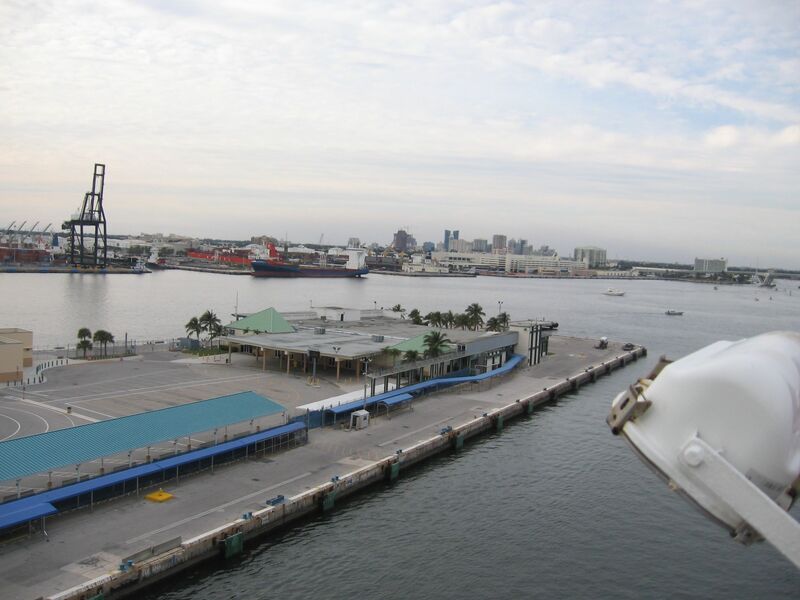 It took ten minutes tops to get from our drop off point at the front of the Fort Lauderdale cruise terminal until we were walking onto the ship. Why do people show up early when for most other events people show up either on time or fashionably late? I believe it’s not the ports of call that attract most people to cruises. It’s the buffet and the promise of as much food as you can eat that really has them signing up, so the sooner you can start the mass gluttony, the better. And generally if you want to find someone that’s where they are. In the case of the Noordam, it’s Deck 9, the Lido (“Lee-doh”) deck with its mostly always-open buffet. And mostly business is hopping on Deck 9, which is also convenient to pools, hot tubs and lots of lounge chairs. This time our cruise was out of Fort Lauderdale, Florida. It came with a bonus: the ability to finally see my sister Teri’s house in nearby Hollywood. She has been there for sixteen years with her husband, her dog and her boat. We avoid Florida except, apparently, as a place to catch a cruise ship. 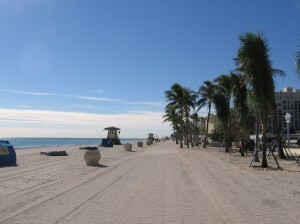 So we arrived a day early to see her and get a sense of Hollywood, Florida where she lives and the Fort Lauderdale area. My general impression was favorable. Florida has a lot of ugly beach communities, but Hollywood is not one of them. It has a long and impressive “broadwalk”, sort of like a boardwalk except it is not elevated, wider and not wooden. It has a charm to it, and tries hard to be the Florida you see in postcards, if you can ignore the condos, hotels and seaside businesses next to the ocean and broadwalk. Nearby Dania Beach to its north is also nice. We stopped at a pier for a quick lunch at a restaurant at the pier and marveled at the cool weather in the 60s and the dry and breezy winds. What soon became more interesting was a school of shark that appeared just off the pier. Everyone outside on the pier eating lunch quickly turned their attention away from their food to the sharks stalking a large school of fish nearby instead. The fish appeared to escape, but probably lost out when they went out of our range. The Fort Lauderdale cruise terminals proved hard to get to, particularly since roads are under construction, which meant weird detours were needed. The cruise terminals are frankly in an ugly part of town, as freighters also load up there, which meant plenty of freight containers for scenery. The view was much more impressive once onboard the Noordam, particularly from the Lido deck. Fort Lauderdale looks great from that high up. It is a major city in its own right, certainly not as big as Miami to its immediate south but catching up quickly and with an impressive skyline. So we quickly settled into our room on the main deck, enjoyed their four-star dining room, then went on our first of what will be many walks around its promenade. Miami was just a twinkling of light in the distant west. It seemed that nothing could interfere with this wonderful eleven day adventure. Then the lights went out. Dead stop. Just an emergency light winked on near our cabin door. After about a minute the emergency power kicked in and the lights came on but there was nothing but silence from the engines. After a few more minutes the captain came on to announce us the obvious. There had been an electrical malfunction. Happily it didn’t last too long and was over in about ninety minutes. Eventually one engine came back online, then the next. Our arrival in the Bahamas this morning was not delayed, but no one will say or admit to a reason for the incident. 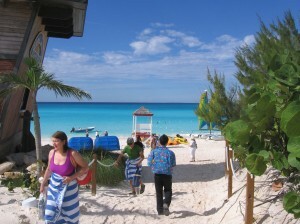 Cruise lines prove that they are major players when they buy their own private island in the Bahamas. 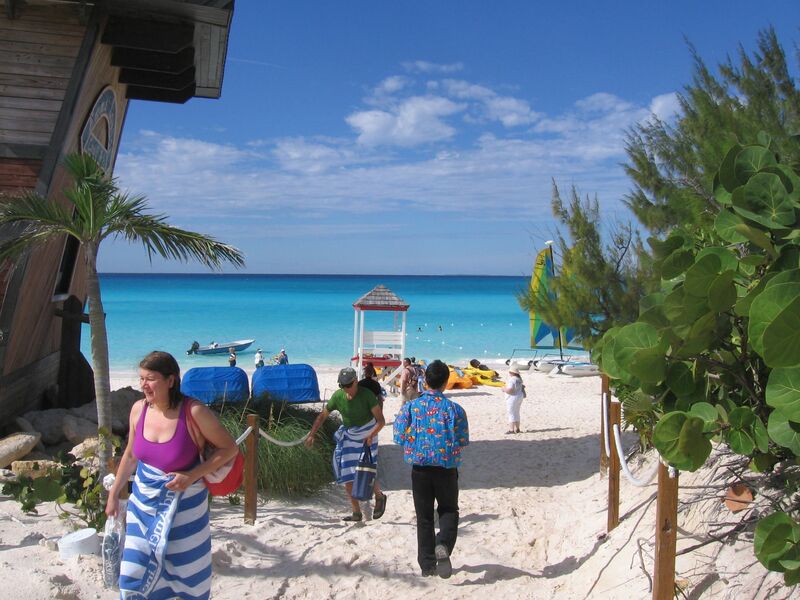 Holland America bought theirs, and it’s called Half Moon Cay. It comes with the usual accommodations for cruise ship passengers: bands playing calypso music and singing Jimmy Buffet songs, white sandy beaches, gift shops and a huge outdoor barbecue where you can gorge yourself sick. That’s what most passengers were doing. Frankly, it made me ill to look at all that greasy food, so I opted for a short walk to the other side of the island instead. A fake shipwreck along the shoreline was actually a bar and allowed another opportunity to get plastered. Despite the sandy beaches and temperatures in the 70s, few were in the water. Empty beach chairs were in abundance. The water was an amazing shade of blue and closer to shore, colored aquamarine. Next stop: Grand Turk Island. Oh I am definitely going to be following this one! My husband keeps ‘suggesting’ we go on a cruise & for a number of reasons I have no interest. I don’t drink…other than socially at weddings etc. I eat to live, not live to eat & was told cruises are all about gorging, & I’m not really a beach person, so why would I find myself on a big boat sailing to them, unless it was something different? He has suggested the Disney lines which friends who’ve been say are really wonderful but I’m still hesitant because it might entail spending hours with excited/tired children.